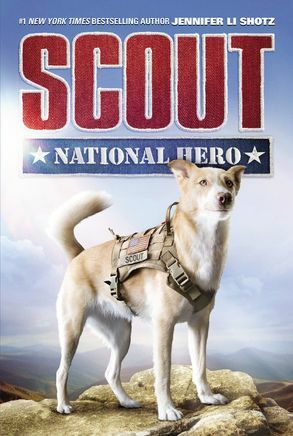 Scout is the new heroic dog in town, and he’s here to help save the nation! Join Scout as he embarks on his own adventures full of courage and canine friendship. From the #1 New York Times bestselling author Jennifer Li Shotz comes a whole new dog adventure full of courage and canine friendship. Scout, once a stray puppy with a troubled past, has grown into one of the best search-and-rescue dogs in Mississippi. And now he’s ready for bigger and better things: Scout is joining the National Guard. But Scout’s new life as a K9 recruit is far from easy as he adjusts to his challenging training and a brand-new family. Twelve-year-old Matt is determined to help Scout feel at home in Nevada, but when a terrifying flash flood hits town, the pair must save the day and prove their worth. As Scout and Matt team up to survive treacherous rising water, lead victims to safety, and attempt to rescue Matt’s sister, they quickly learn that bravery is just the first ingredient in the making of a hero. Does the duo have what it takes to protect their town from the fallout of this devastating disaster? Perfect for fans of Max, Hero, and Cracker!